Y.O. Steakhouse is excited to welcome some of our favorite patrons back to Dallas. Each summer, tens of thousands of Mary Kay Independent Beauty Consultants gather in our great city for Mary Kay’s Annual Seminar, and each year we are honored to host them. In fact, Y.O. Steakhouse is proud to have served and partnered with Mary Kay for several decades. 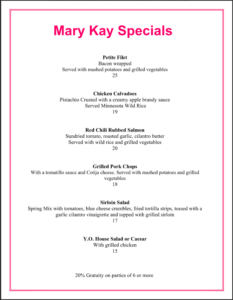 This year, we have hand-picked special entrees and a 3-course menu exclusively available to our Mary Kay guests. As a fellow Dallas business, we take great pride in Mary Kay. Since its opening in 1963, Mary Kay has enriched the lives of millions of women around the world by providing them with a flexible, profitable business opportunity that allows them to pursue both short-term and long-term goals. The company prides itself on equipping women with education, inspiration, and motivation to achieve success. The theme for this year’s seminar is “Discover What You Love,” inviting Mary Kary Independent Beauty Consultants to discover what helps them feel beautiful, confident, and connected. We celebrate Mary Kay for inspiring and empowering so many women and are delighted to show our appreciation to them during the 18-day conference. Whether its your first time in Dallas or you are a frequent visitor, Y.O. Steakhouse provides a truly Texan experience. From our warm, sophisticated dining room decorated with 100-year old brick arches, iron accents, and historic black and white tables, to our authentically Texan menu items and southern hospitality, you will quickly discover why our restaurant is on the “must-do” lists of many Dallas visitors. 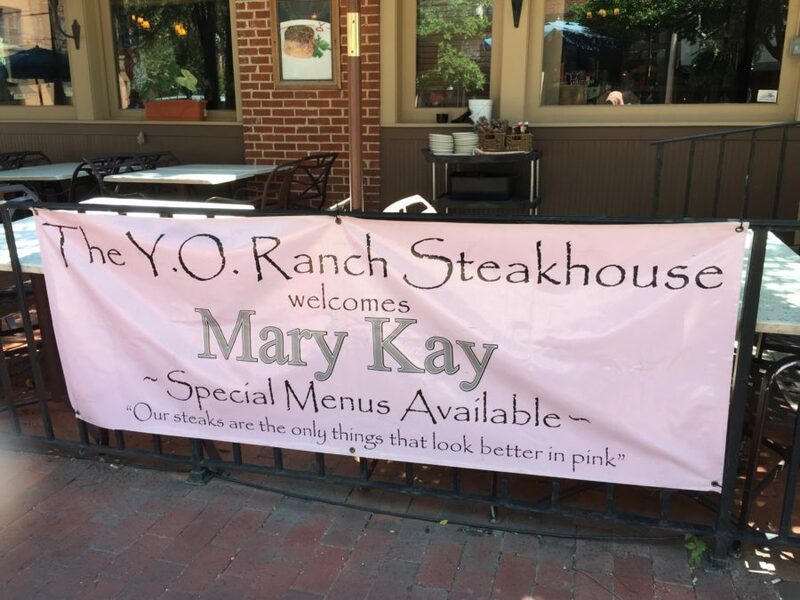 For Mary Kay consultants looking for a delicious lunch or dinner at one of the best steakhouses in Dallas, look no further than Y.O. Steakhouse. 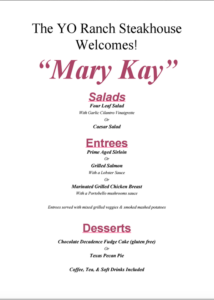 Choose from our special Mary Kay entrees or enjoy a 3-course dinner that you will be talking about until next year’s seminar. Enjoy customer favorites at a special discounted rate offered only to our Mary Kay guests. Choose from entrée items such as the Petite Filet, wrapped in bacon and served with mashed potatoes and grilled vegetables, or our Grilled Pork Chops, covered in tomatillo sauce and Cotija cheese. For those looking for lighter meal options, our Red Chili Rubbed Salmon and Sirloin Salad provide all the Texas flavor without weighing you down. Our Chef and Special Events Director have joined forces to put together a budget-friendly, 3-course menu that offers some of the best items from our lunch and dinner menus. Start off with our Four Leaf Salad with Garlic Cilantro Vinaigrette or Caesar Salad. Next, choose from a Prime Aged Sirloin, Grilled Salmon with Lobster Sauce, or Marinated Grilled Chicken Breast with Portobello Mushroom Sauce – all of which are served with mixed grilled vegetables and our smoked mashed potatoes. End on a sweet note with either our Chocolate Decadence Fudge Cake (Gluten Free) or Texas Pecan Pie. Enjoy unlimited coffee, tea, and soft drinks throughout your meal. Dining with a large group? Our private dining rooms and banquet halls can accommodate anywhere from 20 to 300 people. Book a room for your large party with our simple online booking form and we’ll take care of the rest. Hungry? Our Steakhouse in Downtown Dallas is Just Minutes Away! Excited to try what Jim O’Connor of the Food Network has declared “one of the nation’s finest steakhouses?” At the Kay Bailey Hutchison Convention Center, Mary Kay Seminar attendees are just a quick drive, train ride, or walk away. Our restaurant is in the middle of the West End Historic District, surrounded by some of the oldest buildings in the city. While you’re here, pay a quick visit to the Dallas World Aquarium, Wild Bill’s Western Store, Dallas Holocaust Museum, or Old Red Museum for a dose of Dallas history. We can’t wait to see our old friends at Mary Kay that visit year after year, and we look forward to making many new ones as well! On behalf of the entire city, we wish you an enjoyable (and delicious!) stay in Dallas. Planning a visit to Y.O. Ranch Steakhouse in between seminars? Book a table for you and your fellow Mary Kay consultants.